Our EMS Dispatch software solutions cut your workload, prevent errors, make predictions, offer two-way effective communication, monitor your fleet, encourage QA, and use a highly-visual dashboard to help you benchmark and measure performance for constant improvements. RescueNet EMS Dispatch software solutions enable users to enter, maintain, retrieve and use important data. The system is built with a high degree of flexibility so you have the ability to capture not only the information you must have, but also the information you need to make better business decisions. It’s imperative that call takers and dispatchers have the proper tools to accurately collect and disseminate patient information to deliver better outcomes. RescueNet Dispatch enables you to streamline call-taking and dispatch while reducing response times, making your entire operation more efficient. Analyze your historical demand, create a deployment plan to cover it and respond in real time to constantly changing conditions to place vehicles strategically in the best location. View a map of your service area to see the locations and status of your entire fleet and any incidents in progress. Quickly scan vehicles or open incidents for their status or dig deeper to find out the full story anytime, anywhere. View and respond to trips through Google map navigation to the pick-up and drop-off points throughout your trip using any Android or iOS mobile device. ZOLL Respond allows you to cut out unnecessary phone calls with live chat features and live stream video communication and directly connect field crews to doctors at medical facilities. Get paid more per claim and get paid faster. 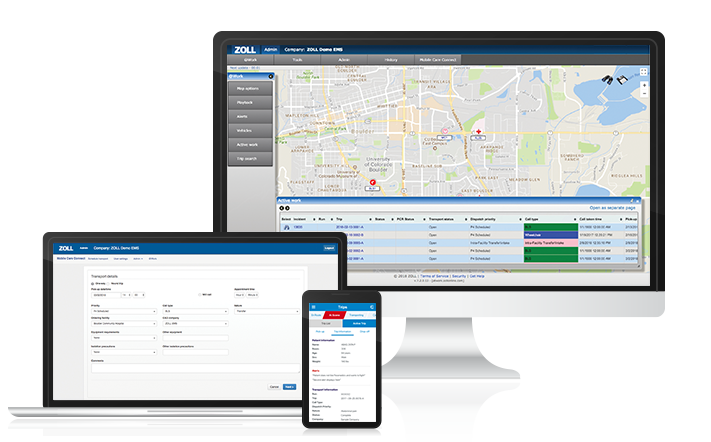 "ZOLL gives us another tool in the arsenal to meet your response times, adjust to system demand, and keep your system working and adjusting on the fly." Streamline call-taking and dispatch while reducing response times. Learn more about our EMS and Fire software.